Uniform Free Day might be officially over on the East Coast of Australia – but we never like to see a party end, so celebrations are still on-going in schools and businesses keen to support Radio Lollipop. We have been overwhelmed by the willingness of so many to get behind our fundraising efforts – all with the aim of providing care, comfort, play and entertainment to children in hospital. Our volunteers began the day greeting commuters at Brisbane train stations, engaging a much wider cross section of the community than we normally reach at the hospitals, while also shaking tins and selling merchandise. Every little bit helps to keep us on air and by the beds of young patients. We then experienced some amazing grass roots support from local government departments and small businesses across this side of the country who got creative and colourful with their work wear for the cost of a gold coin donation. 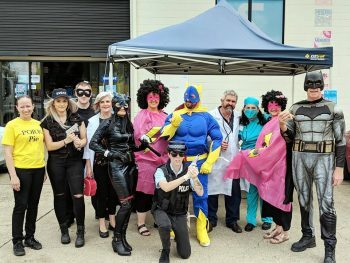 The team from Bolts and Industrial Supplies (pictured) in particular made a super effort to dress up! More dress up days are planned for the coming weeks so we look forward to stretching the great vibe of Uniform Free Day into a month long event! But for now we turn our attention to the birthplace of UFD as Western Australia gears up for the ultimate celebration of all things Radio Lollipop as volunteers and supporters hit the streets, schools, bus and train stations in an eye catching display of the fun that is central to everything we do.